The NEW Meat Lovers Slam is here and it’s only $5.99 ($6.99 in select locations)! Join us at Denny’s for two buttermilk pancakes, two eggs, three sausage links, and three strips of crispy bacon. Hurry, it's time to meat your next meal. 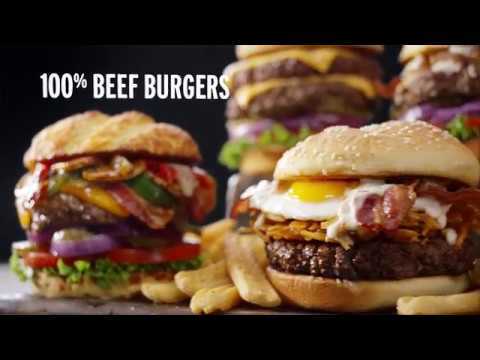 Stop by today to try one of our 100% Beef Burgers in our flavor packed Burger Line-up. Take your pick from the Bacon Avocado Cheeseburger, the Spicy Sriracha Burger, the Slamburger and many more. Hurry in to try one of the NEW omelettes from our Ooh lá lá line-up starting at just $6.99. Choose from our Wild West, Greek Garden or Sunny-Topped Omelettes. Stop by today, we will save you a seat! Are we out of our minds or is this just a great deal? Stop in to Denny's and try the NEW Super Slampler, dig into pancakes, eggs, French toast, AND bacon for just $5.99 - $6.99 in select areas. Take a break from the holiday madness and escape to Denny's. Try our NEW Cinnamon Roll Pancake Breakfast, the mouth watering Garlic Peppercorn Sirloin or everyones favorite Turkey & Dressing Dinner. Hurry in because like the holidays these items wont last long. Fall in Love with the new Pumpkin Super Slam! Denny’s $5.99 Super Slam is getting ready for fall, for just 49¢ more you can upgrade your Super Slam and receive pumpkin pancakes, bacon, sausage, eggs, and hash browns! Hurry, this deal won’t last forever. How Fast Can I Get To Denny's? 100% beef burgers and fries starting at just 6.99! *Price and participation may vary. Limited time only. The Denny's NEW! Super Slam is just $5.99 â€” two pancakes, two eggs, two bacon strips, two sausage links and hash browns. We must be out of our minds! Exclusive Star Wars trading cards. Only at Denny's! Assemble the crew and fly to your local Denny's to collect all 12 exclusive Solo: A Star Wars Story trading cards! A portion of the proceeds will be donated to No Kid Hungry, an organization on a mission to end childhood hunger. Solo: A Star Wars Story in theaters May 25. Dulce de Leche Craft Pancakes just part of Denny's seriously upgraded menu. For a limited time only receive a FREE Build Your Own Grand Slam after your next online order from Denny's on Demand! Try our new Pumpkin Cream, Cranberry Orange, and White Chocolate Raspberry Pancakes this Holiday season! For the first time in the history of history you can have Denny's wherever you want! With the new Denny's on Demand the world is your diner. Get Whatever You Want, Whenever You Want, Now Wherever You Want. Shakes Riding Shotgun? Oh yeah! The New Denny's on Demand gives you whatever you want, whenever you want and now wherever you want. Ordering online just got a whole lot easier with New Denny's on Demand. For the ultimate classy experience, watch this melty Bacon Gouda Burger with the lights dimmed. Itâ€™s classier that way. 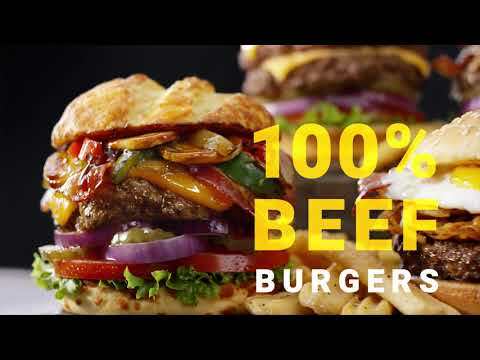 These delicious, made-to-order 100% beef burgers start at $6.99 100% of the time Dennyâ€™s is open. Which is 100% of the day. 100%. 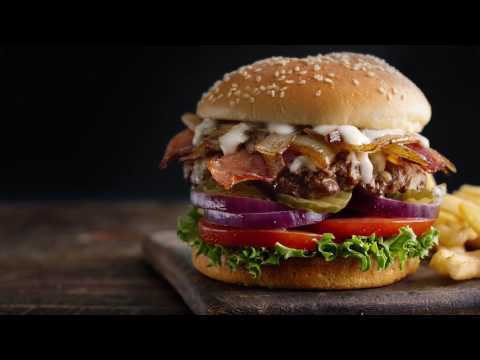 How did we make Dennyâ€™s world famous Slamburger? We never grill and tell. 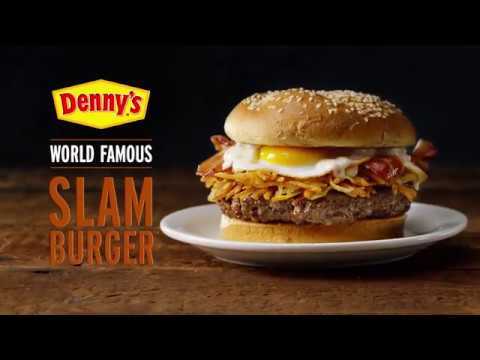 How did we make Denny’s world famous Slamburger? We never grill and tell. At Denny’s, there are now twice as many $4 value menu items for a limited time. See why we use fresh, never frozen blackberries in the Super Blackberry Pancake Breakfast. It&apos;s the season for sharing, except when it comes to Denny’s all-new holiday pancakes. Try our NEW! Salted Caramel & Banana Cream Pancakes, NEW! Pumpkin Cream Pancakes or NEW! Sticky Bun Pancakes for a limited time. Weâ€™re now offering our new, fluffier kids pancakes for FREE. They'll love our DreamWorks Kids Menu and youâ€™ll love the price! For a limited time. Denny's has reworked their NEW! Buttermilk Pancakes. Now they're fluffier, tastier and better. Sorry Grandma...Denny's has NEW! Buttermilk Pancakes. The world of pancakes has changed and even you couldn't have seen it coming. Introducing Denny's NEW! Buttermilk Pancakes. Cheer up dad. Denny's has NEW! Buttermilk Pancakes. Lucasfilm Teams Up With Six Major Brands To Launch Global Promotional Campaign In Support Of "Solo: A Star Wars Story"
Denny’s Announced As Presenting Sponsor Of 19th Annual Tom Joyner Foundation Fantastic Voyage® Cruise - The Party With A Purpose®! Denny’s Donates $2 Million In Fight Against Childhood Hunger In The U.S.
New! Denny’s On Demand: Whatever. Whenever. Now, Wherever. Denny's launches new "Red, White & Bacon" menu in celebration of "Independence Day: Resurgence"